One of the framing guys told me that he expects to finish up the walls tomorrow. He also said that the roof trusses are being delivered Monday morning and will all be in place by Tuesday. Then there's sheathing, siding, trim, and then exterior paint. On the subject of paint, I think we're beginning to understand why R requires selections so far in advance. It's because he's used to clients way fancier than us, who want unusual options that have far-ranging implications. For instance, the paint is only an issue to the extent that, if we were going to stain the eaves, trim, etc., that would have to be done before the boards are put up. Since we're painting everything, that preliminary stage is just primer. Likewise, things like obscure special-order hardware or imported tile would need to be ordered extra-early. We're looking forward to the day when he realizes we're not nearly that fancy and he adjusts his selection schedule accordingly. When we need to select, say, a front door, we are expected to look online or perhaps in a showroom and find the one we like. Then, if we were typical custom home clients, we would select would be told how much it will cost, and we would either like the number or spend the next few weeks lamenting to friends how much we are spending on our (fill in the blank). Apparently that is what one does when money is no object. This is not how we shop. We are used to having access to pricing information and being able to weigh all of our options before making a fully informed decision. This does not, of course, mean that we always choose the least expensive option. If we like one option 10% more than another option, but the option we like slightly more costs twice as much, then the less expensive option is the better value. On the other hand, if we like the more expensive option 50% more than the less expensive option, and the price difference is only 10%, then we would gladly spend the extra money. Since relative costs are not apparent, it's impossible to make this kind of value calculation without bothering someone asking for the prices of many different options. So we're kind of inundating R with options, and he's very accommodating about it, but I'm sure he's wishing we were more like his usual clients, who like what they like and it costs what it costs. Yesterday, a tree company known locally for slaughtering trees dropped off a bunch of mulch (wonder where they got it...). R likes to spread mulch around the house so things don't get muddy. Just in time, too, because today was a pretty soggy day. Fortunately, the mulch arrived before the framing lumber yesterday, so they got it spread under the lumber, too. This morning, before the rain chased the workers away, they made some sawhorses and redistributed some of the lumber. Here are some of the LSL (laminated strand lumber) beams that will be used as window and door headers (for scale, you can see the size of the 2x4s they're sitting on). LSLs are engineered wood designed to be considerably stronger than regular wood. Plus they're recycled, in a sense, from wood chips left behind from other things. Looks like they had just started laying out walls when the rain chased them away. Tomorrow should be nicer. We're going to the symphony, though, so I may not get a chance to post new pictures. I just finished a meal I usually only eat on Thanksgiving: mashed sweet potatoes, corn pudding, and my friend Yokko's delicious cranberry sauce. My tummy is extremely content. It seemed pretty dark to me, but I was willing to give it a chance until I realized that the house is situated in such a way that the sun will usually be facing the back of the house, so the front (which, we agree, is the part that matters as far as aesthetics are concerned) will almost always look darker than its true color. At that point, we were at an impasse. We really wanted to be able to see the colors on an entire wall to get a true feel for how dark they are. 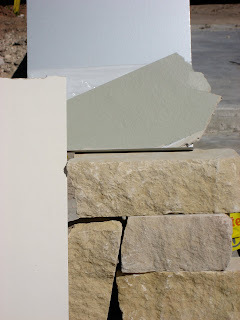 Then we took this sample to another house we like and compared it with the siding. (This house, which we first saw on the Parade of Homes in June and is still for sale, is so beautiful, my heart breaks a little every time I see it. 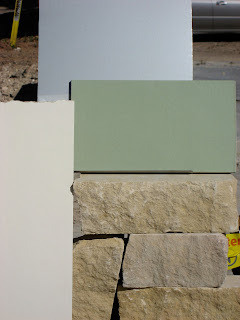 But it costs about double what we could have paid and is on a postage stamp of a lot....) That house, too, had green siding that we really liked, but darker than we want for our house. 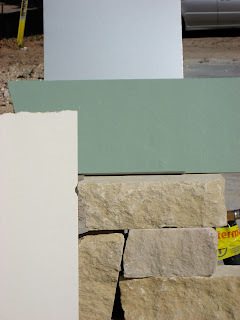 When we compared our sample to this house, our newest sample seemed really, really green. Again, we found that the green siding was closer to the grey color card than to any of the green cards! 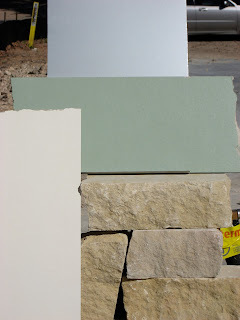 The logical thing at that point would have been to buy a sample of the grey shade between the colors of the R's other house and the darker house (called Hardware), but my brain wouldn't let me order a quart of grey paint when what I want is a green house. 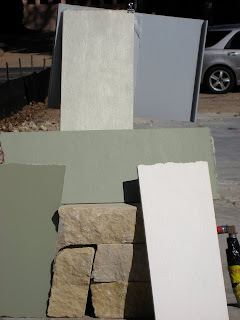 So we regrouped, went back to the paint store, and asked for a mix between our last color (halfway between Clary Sage and Artichoke) and a darker version of Chatroom. The result, which the paint store guys named "Sageroom," looks just right. (Steve would like to go a bit darker, but again, the front of our house is going to be shaded from the sun most of the day, so he sees the value of staying lighter.) 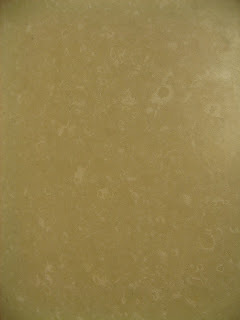 So here is Sageroom, with our stone, our trim color (Panda White), and our galvalume roofing. We took the bunnies over to the house this morning. They had never seen it (although they've heard plenty about it). They were very pleased with what they saw. True to his name, however, Dash proved hard to contain to the bunny room. We went to the door hardware/plumbing fixture/appliance shop yesterday and went over lots and lots of selections. We're kind of in a holding pattern on the door hardware while we wait for them to get some samples in for us to see and touch (although we did run into the Emtek Arts and Crafts front door set in the wild today -- quite nice). We spent a lot of time on plumbing because there are SO MANY CHOICES to make in each bathroom. The master is especially difficult since the bathtub and shower are separate. We have to choose two sinks, two sink faucets, a toilet, a bathtub, a bath faucet, a bath handle thingie, two shower faucets, and two shower handle thingies. The master is going to be the most modern room in the house, so the style is somewhat different, but we don't want it to look like it's from a totally different house, so we're walking a fine line. But I think we figured it out. The toilet, which will be in its own room, will be the same as the other toilets in the house: the Sterling Karsten (a Kohler brand). 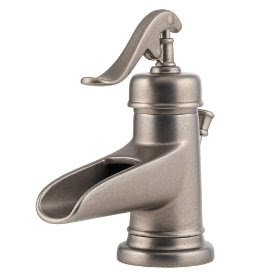 It's low-flow and dual flush, so it's very water-efficient (like most of the other fixtures). I trust you know what a toilet looks like, so I will not bother with a picture. I think I figured our the door situation. 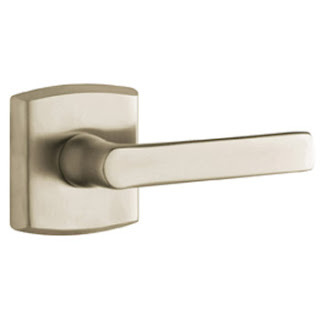 We love the Soho interior door levers but not the front door set (too industrial). 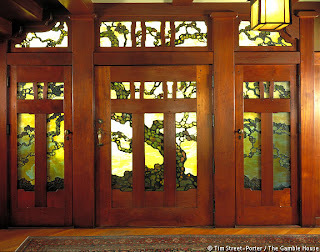 But I love the Emtek Arts and Crafts line, which Steve isn't wild about, except that we agree that the Arts and Crafts front door set (which I didn't show you last time but is shown below) is a better fit for our house than the Soho front door set. Since the interior door handles aren't keyed, they can be a different brand from the exterior doors without affecting the key count. So...Soho interior levers with the Arts and Crafts front door set. Our style is definitely Craftsman. We love the clean, simple style. 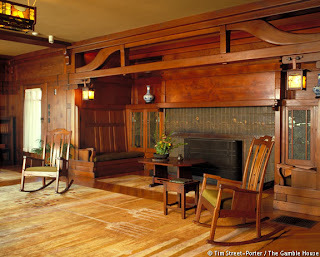 It's more versatile than Arts and Crafts -- can you imagine trying to incorporate modern furniture into this room of the Gamble House? I take back what I wrote the other day about having selection fatigue. Now I have selection fatigue. And, apart from ruling out options (out of an infinite world of options), I don't feel like I've gotten too far. 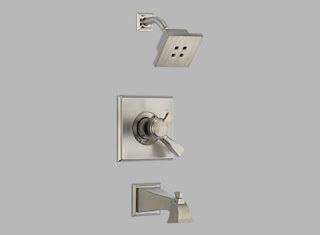 One area in which we have narrowed our choices is door hardware. This is a little backward (like everything else seems to be) in that we're not quite settled on the doors yet. On the interior door front, we've been searching for a couple of months for a nice solid core, single-panel Shaker-style door, to no avail (we know of one brand, but apparently it's so expensive, R won't even suggest that we consider it -- and I couldn't even find a picture of it on the manufacturer's website to show here). As lovely as these are, Emtek has nothing that looked right for the French doors to the back porch (neither did Kwikset), which means that we couldn't key all of the locks with the same key. Plus Steve isn't wild about the Arts and Crafts levers. 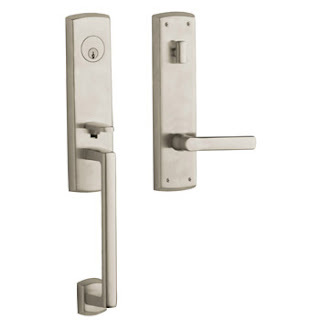 While we were looking at Baldwin's selections for the back door, we found a good contender for all of the locks. The Soho isn't particularly Craftsman; it's a simple, modern-ish style, tending toward a more transitional style in the house (which is more appropriate given the very transitional kitchen and great room and the more modern master bath). The Baldwin option doesn't have a solution for the French doors, either, but I'm hopeful that they'll expand the Soho line in the future to include what we need. The other down side of the Baldwin is that the front door set is more angular than I would choose (however, we would choose antique nickel for the exterior, which won't look quite so stark). Definitely more modern than I would like, and I'm not sure how it would look with the traditional Craftsman look of the front door. So -- what do you think, dear reader? Ashfield? Arts and Crafts? Soho? Or some other option you saw somewhere that would be just perfect for us? The trickle that we saw coming from the road around 1:30 p.m. on Friday had become a swiftly moving stream by 6, when the Austin Water Utility folks arrived to fix it. The irony of our super-efficient house causing the street to hemorrhage water wasn't lost on us. Our neighbors are going to LOVE us for getting the water to the whole block turned off without any notice or explanation. I sure hope no one was in the shower with shampoo in their hair when it was turned off. Two neighbors came out to watch for a little while. How does everyone not find this fascinating? By the time they reached the pipe, it was a pretty big hole. Of course, the equipment used to dig the hole could have made it bigger. We'll never know. The white inside the pipe is 50+ years of calcium buildup, which the workers said isn't nearly as bad as it is in parts of town that are closer to 100 years old. 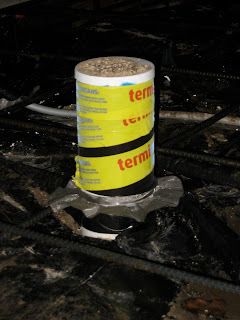 When they finally got all of the water out of the hole (using a vacuum that's surely known in the business as a "water sucker"), they put this big metal bandage on the pipe. That's now the strongest part of our water main. I suppose we can look forward to other cracks and holes in the neighborhood in the coming years. I just hope I'm not in the shower with shampoo in my hair when it happens. There's a lot to update from this weekend, but not much is scheduled for this week, so I'll try to get caught up over the next few days. This picture is from the back of the lot, looking toward the street. I got hung up at work and didn't get to the house until they had already poured the main area of the house and were waiting on more cement to pour the back bedroom. The truck you can (sort of) see in the background is the pumper truck, which the cement mixer truck would pour the concrete into to pump to the far reaches of the foundation. The concrete truck arrived (the white blob in the background), and they sprung back into action. Here is the plumbing for the back bathroom, showing various stages of Termi-Mesh coverage. 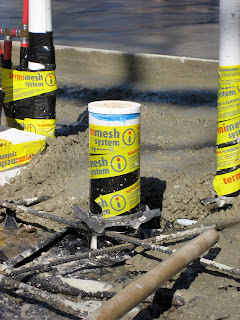 The pipe in the middle still has its Termi-Mesh exposed, the pipe on the right is halfway covered, and the pipes on the left already have the Termi-Mesh embedded in the concrete. Did I mention that we get green building points for Termi-Mesh because it reduces the need for poisonous termite treatments in the future? Here they've finished pouring the back bedroom and have moved on to the back porch. Since the porches are lower than the main floor, they pour them last. The concrete sets really fast (even in cool weather -- it was about 60 degrees on Friday, which is pretty ideal for pouring a foundation). 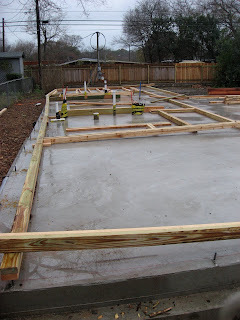 Within a couple of hours of pouring the main floor, they were able to remove the forms on the left, which held the concrete a few inches higher than the patio level and which needed to be removed in order to pour the patio. 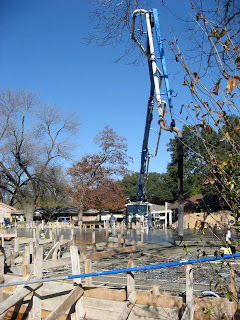 In this picture, the worker is pouring the concrete into the exterior beam, which goes close to four feet into the ground and about three feet above (because the ground is lower at the back of the house). Here are the steps leading from the back porch out to the backyard. When we decided to screen the porch, we extended it by two feet (from 8'x20' to 10'x20') so that it won't feel cramped with separate sitting and dining areas (plus a designated area for the grill). It got dark around 5:30, so the workers set up lights and kept on working. They paid particular attention to smoothing the surface in the garage and porches because those areas will be exposed when the house is finished. This post could be titled "Don't Wear Cashmere to a Foundation Pour." Or "My Green House is Hemorrhaging Water." Or (this one is courtesy of Steve) "The House Looks More Complete with a Foundation." 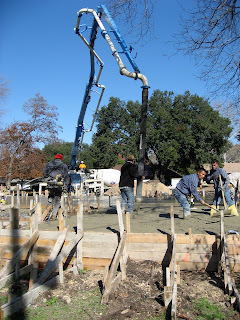 Everything went pretty smoothly with the foundation yesterday. They started around 9 am and finished up around 7, then returned today to remove the forms. I took a long lunch to watch some of the work. 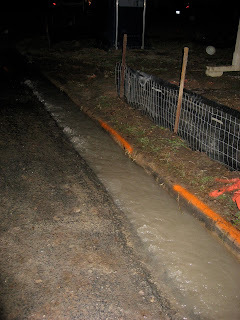 When I left around 1:30, one of the workers had just noticed a slow but steady trickle of water coming up from the road in front of the house. R called the city to report what appeared to be a water main leak. While the construction didn't cause it, it's likely that the concrete truck put just enough pressure on the asphalt to cause the ground under the road to flex just enough to lead to a leak. Anyway, by the time we returned after work, a pretty fast-moving stream was erupting from our curb. We stayed for about an hour to watch the city's crew dig up the pipe and repair it with what looked like an industrial-strength bandage. Very exciting. Had to post a second one today. The slab is going in tomorrow (Friday).